The Bengals head into Heinz Field with the AFC North all but locked up and with a chance to earn a postseason berth this Sunday. Cincinnati will get that spot with a win over Pittsburgh or a loss or tie by the Ravens or Dolphins. The Bengals have won three straight games and have played well in all areas in recent weeks. The offense has come alive slowly, and the defense, despite many key injuries, is still a top ten unit against the pass and run. The Bengals also boast one of the NFL’s top pass rushes. 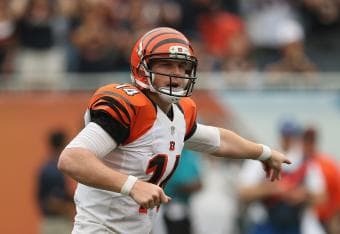 The “good” Andy Dalton has been showing up recently, and last week’s 42-28 win over the Colts was one of his best games of the season. He threw for 275 yards, threw for three touchdowns while rushing for another score and had no interceptions. With that said, their passing game has struggled at times this season and the ground-game has more than picked up the slack. Pittsburgh has not been mathematically eliminated from the playoffs, but they are a far cry from realistic contention at 5-8. This year’s team has been uncharacteristically different from Steelers teams in the past. Their defense has been quite poor for most of the year and offensively have relied on offensive coordinator Todd Haley’s short passing game. Last week, the Steelers lost again in heartbreaking fashion at Heinz Field, 34-28. After taking the lead several times in the second half, Pittsburgh’s defense gave up what would become a game-winning drive for the Dolphins and quarterback Ryan Tannehill. Wide receiver Antonio Brown almost ran a gadget play full of laterals and pitches for a touchdown on the game’s final play, but ultimately stepped out of bounds before getting into the end zone. The Steelers will be without defensive end Brent Keisel this week as he has been ruled out with a foot injury. This will be a critical loss for Pittsburgh, who has already struggled against the run this season. The injury is undoubtedly a significant plus to Bengals’ running backs Giovanni Bernard and BenGarvus Green-Ellis. These two teams played back in Week 2 at Paul Brown Stadium. Cincinnati won that contest 20-10 and to drop the Steelers to 0-2. Dalton did not have a decent night throwing the ball, but Giovani Bernard rushed for a touchdown and caught another score in the win. Pittsburgh opened as +3 underdogs, but that line is now gone. Most sites have them listed at +2.5, but that may also be trending downward. The total has moved up from the 40.5 opening number. It is listed at 41.5 or 42 at the majority of shops. One of the biggest knocks against Andy Dalton has been his poor play against the Steelers over the years, and while I do not think he will have a monster night against Pittsburgh – this defense is not your Grandpa’s Pittsburgh defense. They have been beaten up all year, especially against the run, and I would expect to see the same tonight. Pittsburgh cornerback Ike Taylor has also been one of the worst in the league this year, and physical, tall receivers like A.J. Green have had some tremendous games against Taylor. However, if there is a play on this game I think it is the total. Both of these teams lack the ability to stop one another, the Bengals pass rush is their best attribute, but I think Big Ben still manages to find the end zone several times in this game. Led by Antonio Brown, the Steelers’ passing offense has been one of the best over the past five weeks. The total has moved up since the opening number and will likely get even more late action after the afternoon’s games have finished.